12. RHIPSALIS TRIANGULARIS Werderm., Repert. Spec. Nov. Regni Veg. 42: 3. 1937. Type: BRAZIL. 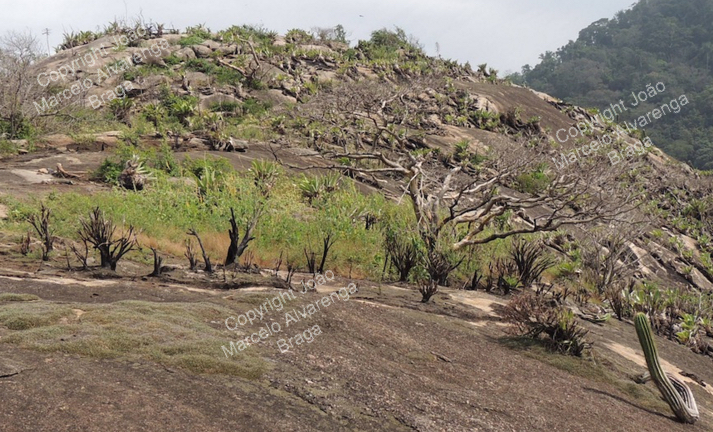 Rio de Janeiro: Rio de Janeiro, Parque Natural Municipal da Prainha, 2003, Calvente 37 (neotype, here designated: RUSU; isoneotype: R, RB). Lithophyte in open habitat, 0.5-1 m long, branching apical. Stem segments, triangular to tetrangular, rarely pentangular in longitudinal section, 1-3(-4) mm diam, olive green, succulent, stiff, monomorphic, 6-24 cm long, base attenuate, apex truncate, wings 3-4(-5), (0.5-)1 -2(3\ cm wide, margin serrate to crenate, plane, with 4-7 mm projections, midrib 5-7 mm diam, cylindric. Areoles between margin projections, 1.5-2.5 cm apart, first of segment 0.5-2 cm distant from segment base; when sterile 2-5 mm diam, pilose, with vestigial scales; when fertile ca 3 mm diam, pilose at margin, with numerous acicular scales, 1-3 flowers/fruits. Flowers 15-25 mm diam; pericarpel 5 X 6 mm, obovoid, pinkish green to magenta, glabrous; with 3-4 sepaloid tepals, 1-2.5 mm long and 10-12 petaloid tepals, 4.5-10 X 3-5.6 mm, wide elliptic or elliptic, patent to sub-erect, white, apex rounded, slightly to strongly cucullate, margin curved inwards. Style 7-8.5 mm long; stigma with 5-7 lobes, 2.5-3 mm long, sagitate, erect. Ovules in 5 rows, funicle short (< 0.5 mm long). Stamens 70-160, 5-7 mm long, median shorter, internal facing outwards and external facing inwards, white. Nectary ca. 1 mm long. Fruit 6-7 X 7-8 mm, globoid, magentato pinkish, glabrous. Notes; R triangularis is well characterized by the large flowers, long style and stem segments with deeply serrate margins. This taxon was described from a cultivated specimen that was sent from the Botanical Garden of Rio de Janeiro to the Dahlem Botanical Garden. However, this specimen was lost requiring the establishment of a neotype. The lack of a type specimen contributed for the uncertainty on the correct application of this name. However, the recent discovery of new populations of R. triangularis in Rio de Janeiro (Calvente and Andreata 2007), allowed for a more careful examination of R. triangularis in the field and a better circumscription of this taxon. This species is closely related to another species from the inselbergs of Rio de Janeiro (R. cereoides); however, these taxa have non-overlapping distributions. 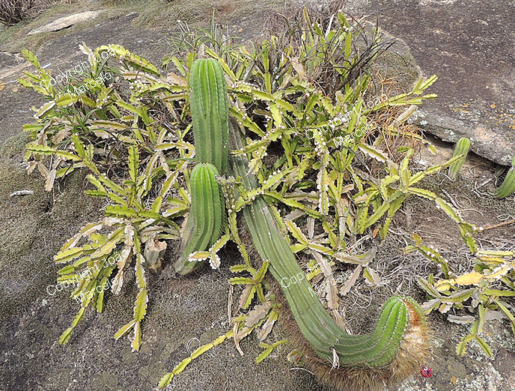 Habitat and distribution: Occurs in southern coastal inselbergs of Rio de Janeiro (Rio de Janeiro, Brazil). 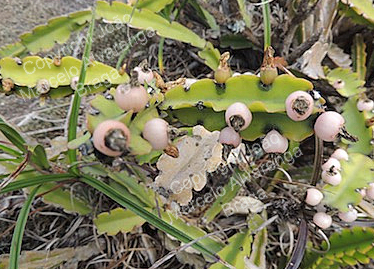 It is currently only known from the Natural Municipal Park of Prainha (Rio de Janeiro, Brazil). Areoles. set in slight notches, with 3 - 4 white bristly-spines. Habitat - Brazil (locality not known).